Today, the team split up to work in two locations. Below are the stories from three team members who were split between both groups. Today was our day to finish the work in “Uncle” Mikes house that we began yesterday. Yesterday we focused on gutting the place, but today Mikes place began to take shape again. As we finished removing things and began to clean and sterilize, we could feel the hope return again. Mike mentioned several times how our team was always laughing and smiling while also working feverishly to complete the tasks. First of all, this is an incredible operation. You wouldn’t believe the amount of materials that arrive and leave every day. 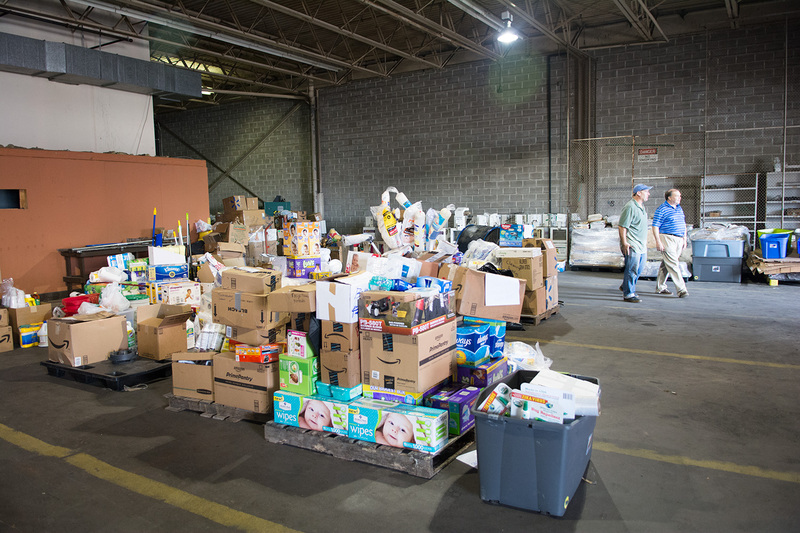 We’re talking, literally, about pallets of cleaning materials, food, personal items, dog and cat food, etc. The folks working here are so conscientious about making sure that enough of the proper materials got bundled together. There are pre-assembled cleaning kits, complete with bucket, wipes, gloves, all lined up and ready to go. Bleach is very important for the sanitization of these affected homes because it kills mould. Pallets and pallets of bleach were in the back of the warehouse ready to be distributed. One of the duties I had over the last two days was to open boxes, sort and inventory the contents, and then redistribute them for the trucks to pick up. But the amazing part was that most of the boxes to be opened came from Amazon, groups around the country and individuals. So you could go to Amazon, purchase items that are needed for the relief and have them sent directly to the warehouse. There were SO many of these boxes with toothbrushes, shampoo, toothpaste, general hygiene items, and food. It was so touching these donations came from all over the country. 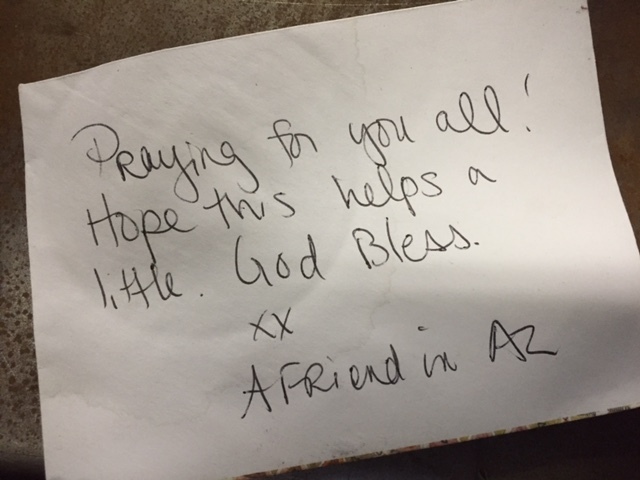 There was such an outpouring of concern and love from our citizens that it was really touching. 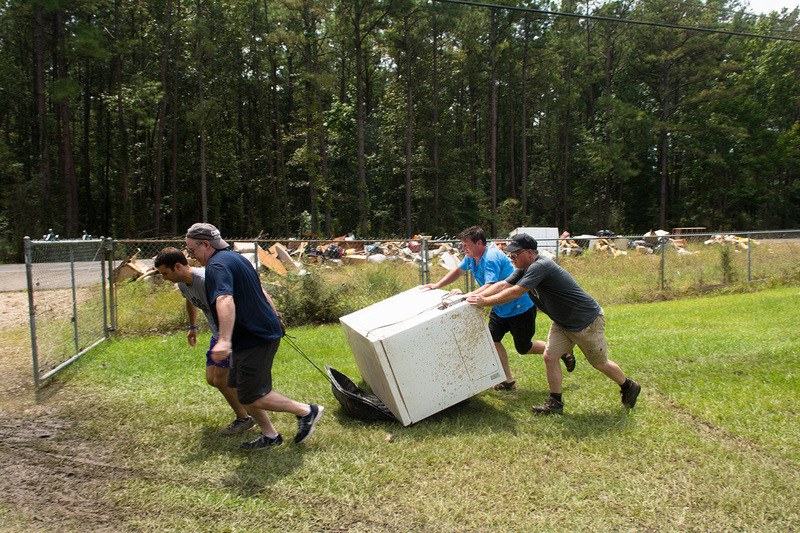 Our time in the Hammond warehouse gave us an opportunity to work with and observe how this team handles donations from Disaster Relief that results in various kinds of donations. Yesterday we made kits for a set of homes that needed assistance in recovery while we divided up all the deliveries from e-commerce and company donations.